While volunteering at the New York Public Library, I became interested in children’s literature. Almost every week I was reading a new book to a new child. Every child I worked with, was able to pick out a book of their interest for me to read to them. It didn’t take long for my journal to be filled with children author’s, illustrators, and photographers. When the year was up and I started to work, I missed working with children and reading children books. To fill this void, I contacted all the artist that I could, offering my services for almost nothing but experience in return. Javaka Steptoe, an African-American children’s book artist, replied to my email almost immediately. We begin working together. A little after I began to work for him, his recent book, Jimi: Sounds like a Rainbow, (written by Gary Golio and Illustrated by Javaka Steptoe) was listed on The New York Times Best seller list. Working with Steptoe gave me a better view of the “children book world” and has allowed me to meet legendary artist like himself. Some of them assumed that I was also an illustrator or at least an author. Well, not yet. One of the most exciting book events I’ve been to so far happen at the beginning of this month. I was blessed to attend the 19th Annual African-American Children’s book fair held in the city of brotherly love, Philadelphia, Pennsylvania at the Community College of Philadelphia gymnasium. As a little girl, I always enjoyed going to book fairs. However, I never been to one as grand as this one. 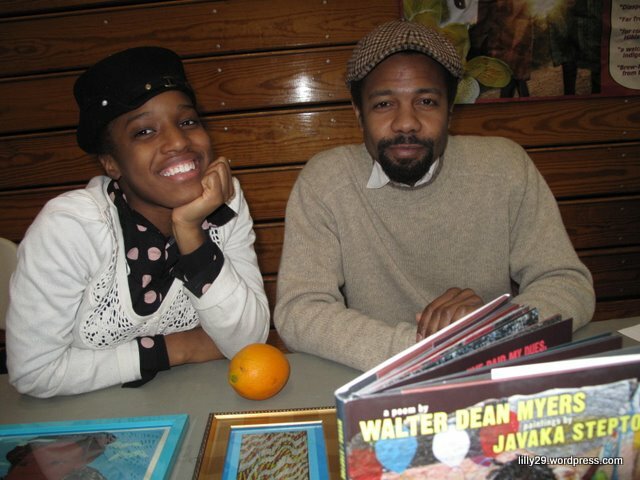 For starters, there were a good amount of authors and illustrators there to meet the children: Javaka Steptoe, Sean Qualls, Bryan Collier, and Renee Watson just to name a few. Imagine being in third grade and meeting the person who wrote your favorite book? I didn’t even imagine that when I was a third grader. There was also gifts for the children which I think the kids enjoyed the most. I enjoy working with Steptoe and look forward to more projects in the future.